At the start of the twenty-first century, urban violence represents one of the most significant challenges for development across much of the Global South. This essay introduces a new framework for analyzing the politics of urban violence that combines a subnational comparative perspective with multi-method and multi-level approaches. 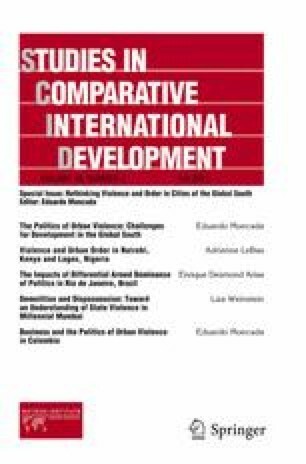 The empirical contributions to this special issue analyze the politics of urban violence and its consequences for development in major cities across Africa, Latin America, and South Asia. First, the contributors show how variation in the nature of relations between states and local armed actors poses distinct implications for several outcomes, including patterns of violence, associational life, and economic markets. Second, the volume unpacks how the integration of developing world cities into both licit and illicit global economic flows impacts local patterns of and political responses to violence. And, third, the contributions identify how actors and interests that operate at multiple territorial and institutional scales influence the local dynamics and consequences of urban violence. I thank Richard Snyder, two anonymous reviewers, and members of the SCID Editorial Collective for their helpful comments and suggestions on earlier drafts. Population Reference Bureau (PRB) (2010) Trends in urbanization by region. Available at http://www.prb.org/Publications/GraphicsBank/PopulationTrends.aspx. Accessed on October 18, 2011.